Sega and Rebellion Entertainment's upcoming Aliens Vs. Predator gets a little more Alien cred in the form of Lance Henriksen. The actor has been tapped to reprise his role as Bishop in voice and face for the forthcoming shooter. That's Karl Bishop Weyland, mind you, descendant of Charles Bishop Weyland from the Aliens vs. Predator film and not the milk-blooded Bishop 341-B from Aliens. So expect human colored blood to explode from this Bishop, should we get the chance to cause him bodily harm. "This is the first time I've been fully represented in a game, with my voice and how I look, and the Rebellion guys have done a great job," Henriksen said in the announcement. "I might score from this game!" 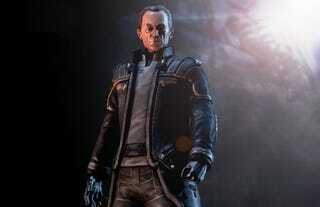 Yes, Lance Henriksen is looking to pull some tail from Sega's Aliens Vs. Predator, a pick up tactic he might find more difficult than originally thought.